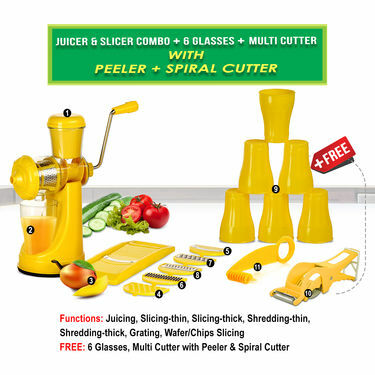 Unlock the natural benefits of fruits and veggies with this powerful Juicer & Slicer Combo along with 6 glasses & multi cutter with peeler, spiral cutter a great addition to your kitchen essentials. 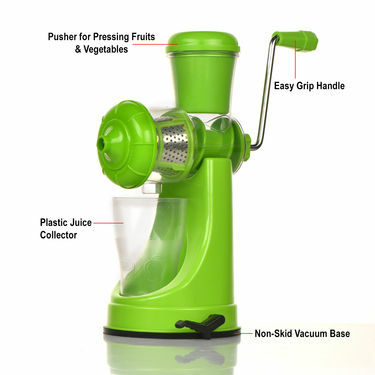 While the juicer extracts every drop from fruits and vegetables, the slicer makes food preparations like shredding, grating, slicing, etc. a lot easier and faster. 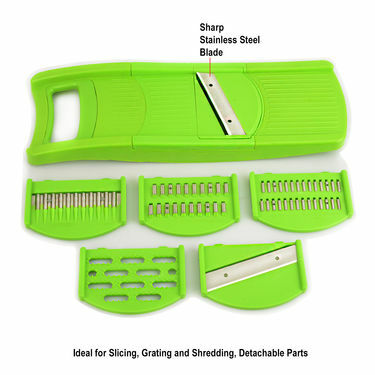 The sharp and high-quality stainless steel blades are rust-proof and stay sharp for a long time. 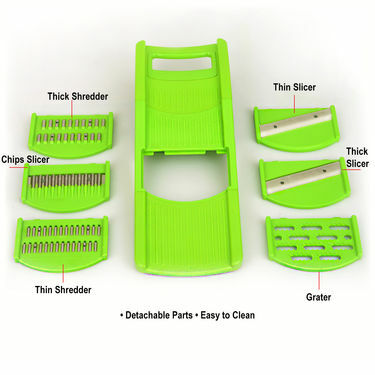 Made from ABS Food Grade Quality, the combo is handy, easy to assemble, and comfortable to use and clean. Thanks Naaptol for this wonderful combo. 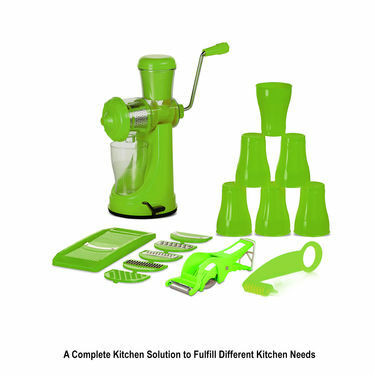 I am really happy with the purchase. 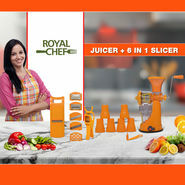 The quality is good also the product is very reliable and easy to use. 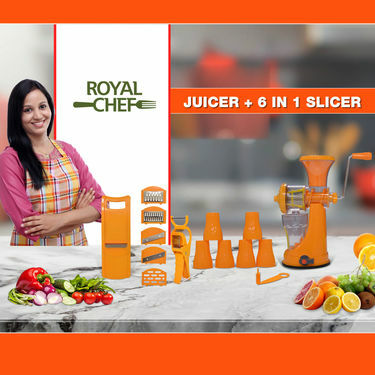 Juicer & Slicer Combo + 6 Glasses..VSRoyal Chef Juicer - Buy 1 Get 1 F.. Juicer & Slicer Combo + 6 Glasses.. VS Royal Chef Juicer - Buy 1 Get 1 F..
Juicer & Slicer Combo + 6 Glasses..VSRoyal Chef Juicer + 4 in 1 Drum S.. Juicer & Slicer Combo + 6 Glasses.. VS Royal Chef Juicer + 4 in 1 Drum S..
Juicer & Slicer Combo + 6 Glasses..VSRoyal Chef 4 in 1 Drum Slicer Shr.. Juicer & Slicer Combo + 6 Glasses.. VS Royal Chef 4 in 1 Drum Slicer Shr..
Juicer & Slicer Combo + 6 Glasses..VSRoyal Chef Jumbo Juicer + Free Mu.. Juicer & Slicer Combo + 6 Glasses.. VS Royal Chef Jumbo Juicer + Free Mu..